Welcome to Cause & Effect Pedals! NOTICE: We are down to less than a dozen FET Dream Pedals. These are slightly blemished (e.g. minor mars in the finish). We are offering them at a $20 discount. When they are gone we don't know when the next batch will be... we need to see significant interest to purchase a bulk order of components and boards. CE Pedals is founded on a philosophy of combining excellence in design and engineering with a boutique attention to detail. In our quest for tone, we've bought numerous pedals only to be disappointed with the lack of innovation and mediocre sound that so many delivered. As electrical engineers and hobbyists building tube amps, we finally decided it was time to take matters into our own hands. 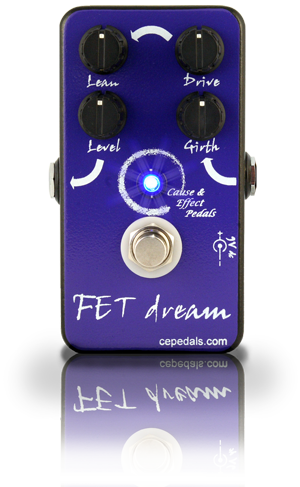 Taking a no-compromise approach to designing an overdrive / distortion pedal resulted in our first product, the FET Dream. Each FET Dream pedal features hand selected and individually tuned components which sets a higher standard in sonic excellence. Electrical and mechanical designs minimize unwanted behaviors like noise and switch pop while maximizing reliability and help to accommodate our boutique tweaked aspects of the circuitry. This approach will be applied to all future CE Pedals as we expand our product line. We appreciate your business and hope that we can move you one step closer to finding 'your' sound. Feel free to use our contact form to comment on your CE Pedal experience. Your feedback will help us to extend and improve our line of pedals and amps.